The Power of Annotating and Sharing Gigapixel Images. 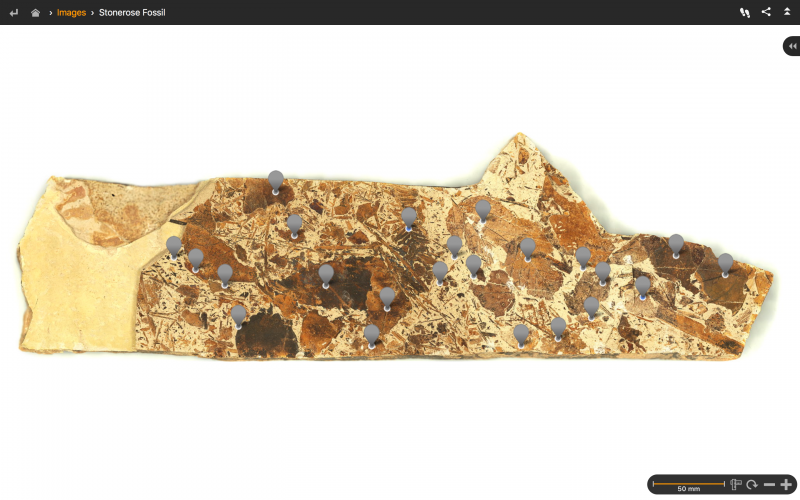 The power of annotating and sharing gigapixel images was shown when we were at the Geological Society of America conference in Seattle recently. We got chatting with the folks at the Stonerose Interpretive Center in Eastern WA state, right by the Canadian border. They showed us the fossil below and we wanted to image it! We made the image whilst we were at the conference then, as we usually do, we sent the folks at Stonerose a link to the viewer image. And here’s where the magic happened: someone from Stonerose looked at the image and realized that they can add value for scientists, paleontologists, and general viewers. 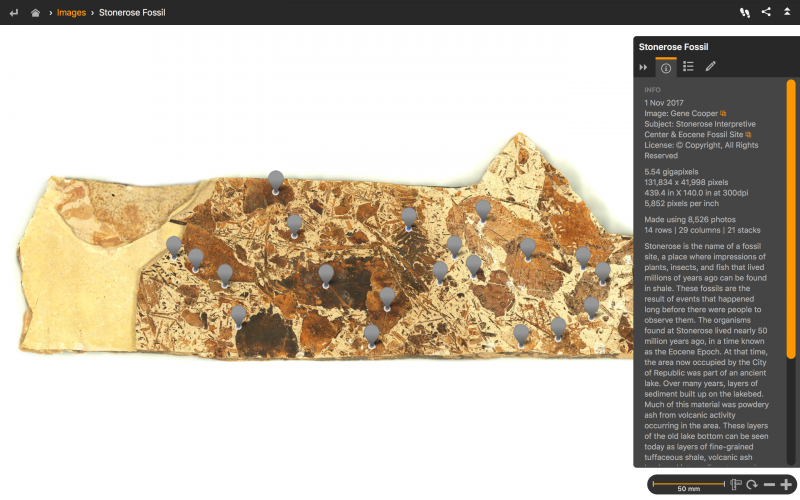 So they created a GIGAmacro Viewer account and then marked up Features (that’s what we call annotations to an image) in the fossil. Now if you go and view the image (please do!) you can turn on or off any (or all, with a single press) of the Features. Just make sure that the Information panel on the right side is expanded (press on the << arrows if it is hidden) and then click in the Features list, as in the image below. Making annotations like this makes it easy to share information with the public – for example at an exhibition – or for a group of researchers to jointly annotate and communicate their questions amongst a closed group. When we see this sort of thing happening, Gene has a contented smile on his face: it means that the long-term vision we have for the GIGAmacro Viewer – the power of annotating and sharing gigapixel images – is becoming a reality! Please share this blog on your social media.